Enjoy a day, watching the racing, come rain or shine. 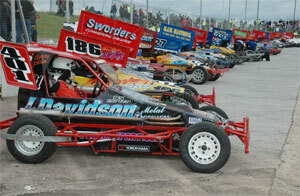 Short oval motor racing is a fun day out for all the family. 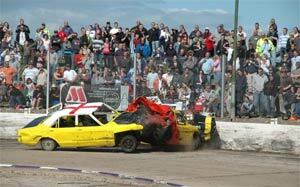 There is unlimited access to the pit area, hot and cold refreshments, and spectators are invited to bring a seat or a blanket, to pitch up on the spectator bankings and view the action. Races are usually set up, contested and cleared at a rate of approximately four per hour, so a full race meeting which typically consist of between 12 and 15 races, will last between three to four hours. For a 1.00pm start time, there is pre-meeting practice between 11.30am and 12.30pm. The Grand Parade is at 12.50pm, and the first race at 1.00pm. 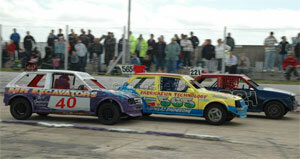 Bangers race, spin and often crash; and the Ministox are for juniors, with the stars of tomorrow aged between 11 and 16. Size: 350m tarmac oval with plate steel safety fence. Facilities: Access to pit area and limited arena parking. Hot and cold food.